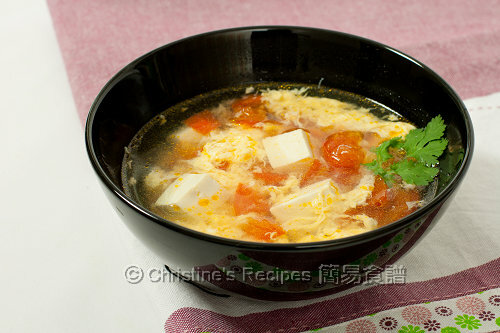 This Tomato Tofu Egg Drop Soup is an old-fashioned, simple soup that we grew up with in Hong Kong. All you need is to add only three to four ingredients into a pot of stock (or water), then bring to a boil. The highlight is the ribbon-like silky smooth eggs. After I posted this quick egg drop soup (蛋花湯) on my Chinese blog and fan page about two weeks ago, some of my fans responded with warm remarks that this soup reminds them of their good old days when they studied overseas. I feel what they feel, totally with them. I know many overseas students have to cook by themselves for saving up money for their tuition. They don’t have many spare money to cook dishes with expensive ingredients. This soup is simple, homey and downright easy to whip up especially at times you don’t have many ingredients stocked in kitchen. Not only this soup is handy, it’s not expensive. Best of all, it contains lots of nutrition we need. Rinse the tomatoes. Soak in boiling water for a few minutes and remove the skin if desired. Cut into smaller pieces and remove the seeds. Set aside. Cut tofu in to 1 to 1.5cm cubes. Use a large pot, pour in water and the stock, then bring to boil over medium-high heat. Add the tomatoes and cook until tender. Lower the tofu carefully. Once it boils again. Turn off the heat. Steadily pour in the whisked egg and gently stir around with chopsticks, a large spoon or a fork. The egg should immediately turn into ribbons. Season with salt. Serve hot. As this soup is made by tomato, tofu and eggs, the taste is very light, without any intensive flavours, yet very healthy of course. If you still want to entertain your taste buds, you might like to use good quality, flavourful stock. Any stocks will work, like fish, chicken, beef or vegetable soups will add a depth of flavour into it. Homemade stock is the best for this. Yet, you can use homemade or canned soup to your liking. The egg drop is an interesting point of enjoying this soup. Don’t overcook the eggs. When pouring in the whisked eggs, don’t let them sit in one place, and gently stir them around. Can't agree more, this is a simple, nutritious, yummy and inexpensive soup to make at home. A delicious soup that should be adopted by students and non-students everywhere! This looks delicious, most important, it's easy to prepare! The soup sounds terrific with tomato and tofu! Oh yeah, this brings a lot of good old memories! Easy and simple soup, just delicious! I have not had this for the longest time ever! So good. This is just like a soup my mom makes when I'm feeling ill. Love simple comfort food like this. I like and clear soup with tomatoes as they give that slightly tangy taste! Mmmm....my favourite....healthy, delicious and appetising. I miss this soup so much... My Mom always make it for me when I was in VN (10 years ago) It's one of my fav, and I will just eat up the whole pot..... Dang, it's such a long time since I had it again. (though I consume eggs frequently). How about using pork stock? As you did not mention it, is it not as appropriate as beef, fish, chicken and vege stock? Thanks! You might try pork stock. It'd be good too.